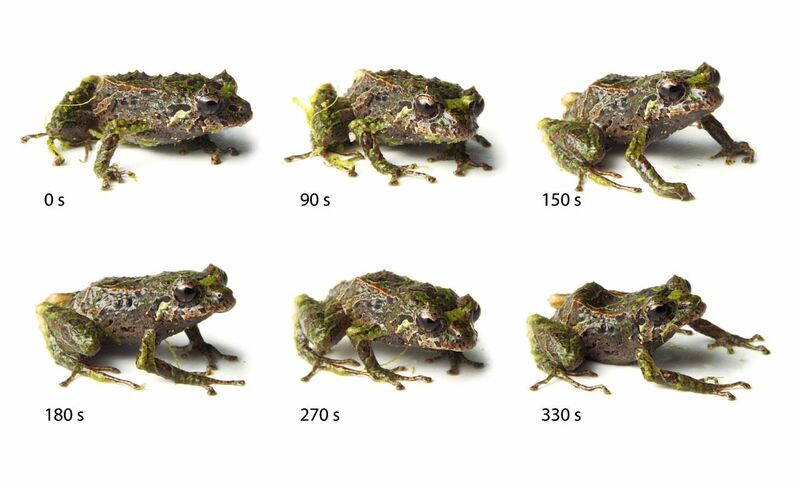 Researchers have found a small frog species that can rapidly change its skin texture from spiny to smooth and back again. It is believed to be the first known amphibian species to have this skin-morphing ability. The frog was discovered by PhD student Katherine Krynak and her husband while on an annual trip to Reserva Las Gralarias, a nature reserve in north-central Ecuador. On a misty nighttime search for wildlife, the couple spotted a small, spiny frog, about the width of a marble, sitting on a moss-covered leaf. They captured it in a cup and nicknamed it “punk rocker” due to thorn-like spines covering its body. A description of the species, called Pristimantis mutabilis, or ‘mutable rainfrog,’ was published in the Zoological Journal of the Linnean Society. Colleagues working with the couple recently found that a known relative of the frog, Prismantis sobetes, shares the same texture-changing ability. Next Post Attacked by Leafcutter Ant!